As we near the Gilmore Girls finish line, we need to get Lorelai and Luke closer together, and get Rory a job. One of those things appears to be easier than the other thing. To Luke’s credit, Lorelai car-shopping is the most infuriating form of Lorelai. But Luke’s first drive up to Lorelai’s house since the day she told him she slept with Christopher is definitely noteworthy, and yes, the return of the banter is a welcome relief after so much politeness between the two. Really, I can’t be anything but happy for Paris Gellar for getting offers from six schools. Ever since we’ve met her, she has been nothing but singularly focused on her ultimate goals. Remember Habitat For Humanity because it would look good on her college applications? The only reason why she didn’t get into Harvard was plot-related, so it’s great that she finally gets to go there, and Doyle loves her enough to follow her, not the other way around. The fact that Rory seems dismayed that things aren’t easily falling into her lap stands out even more against so much of Paris’ considerable effort. And it’s good that the show resolves the Sookie-Jackson vasectomy thing, because of course, Sookie would have some resentment, especially as she’s hauling that baby around. But with only four to go, “Riding A Bike” is pretty much a nothing episode, unless you really like car lots. "It's Just Like Riding A Bike"/"Lorelai… Lorelai?" I think about Gilmore Girls way too much, as you know, so I have developed a theory. Lorelai had to be strong and self-sufficient because she was out on her own, with very little support. Rory grew up with not only a super-strong mother championing her, but an entire town behind her, and the considerable support of her grandparents. So she’s never really had to be that self-sufficient out on her own, which is why she’s completely undone by not getting the competitive Reston scholarship. And honestly, a letter from the Chicago Sun-Times that they’re not hiring is nothing to fall apart over. It goes back to the fact that what Mitchum told Rory is essentially true: She’s missing an essential tenacity. You receive what isn’t even a rejection letter and go home and hide under the covers? Even Lorelai realizes that Rory is used to getting what she wants, and she hasn’t really had too many setbacks to get over to help her develop a backbone of her own. Again, it sets up a lot of what we see in the revival, but for all the show’s focus on growing Rory Gilmore, it’s disappointing to see her fall apart over a few pieces of mail. And the Weston was what, just a few months anyway? I don’t get what her plan was: She would be so amazing in this short stint that the Times would automatically hire her? But really, all of that falls away this episode (even Zack going on tour and Lane staying behind to hang with the twins) compared to that karaoke scene. I can’t watch it without crying and I’m not even sure why. 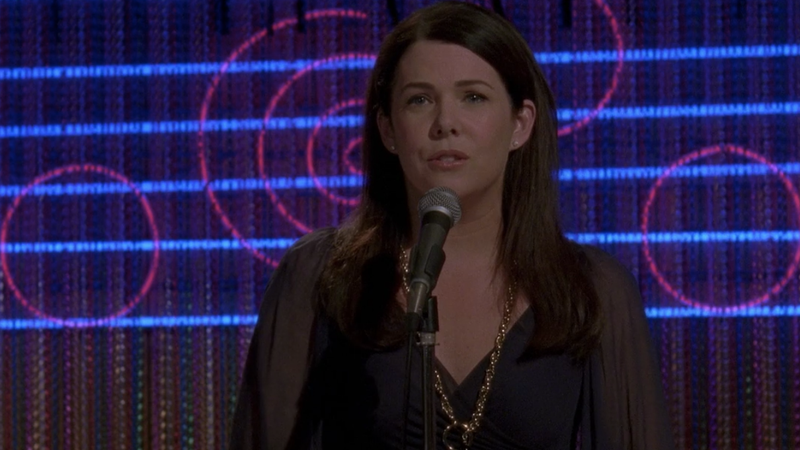 How Lauren Graham (who can definitely sing, unlike some other karaoke monsters I could mention, namely myself) switches the song from being a cute farethewell to Rory on the eve of her graduation to a wrenching torch ballad straight to Luke is nothing short of an astonishing performance. Probably the best scene of the show in all of season seven. Luke even hangs his head at one point, unable to even process the giant outpouring of emotion from that stage. It’s like Lorelai isn’t even really aware that she’s doing it; she’s just singing what is actually in her heart for all the world (well, Stars Hollow) to see. It’s amazing, and was worth an Emmy nomination just on its own. Miss Patty throws her own hand over her heart at the end; I feel the same way, Patty. It’s definitely enough to make Luke feel better about sending the summer in Star Hollow, that’s for sure. Just a stellar Luke-Lorelai moment in a series that was chock-full of them. This week in Gilmore entitlement: Your ex drives all over tarnation to find you a new engine for your old car and you don’t even offer as much as a simple thank you. Lorelai says in Rory’s dream sequence that she’s always wanted to go to Hawaii; Lauren Graham was born there. The effort to get those adorable baby twins into the stroller brought back some nostalgic but also painful flashbacks for this twins mom. Best Gilmore Girls outfit: It’s an ensemble 10 years old, but I really envy Lorelai’s purple print dress and gray boots. Worst Gilmore Girls outfits: That neck-tie dress. And what is with all the puffed sleeves? It’s like Anne Of Green Gables over here. I knew that Liz Torres and Sally Struthers were both in the CBS sitcom family of the ’70s (Sally on All In The Family, Liz on Phyllis) but I didn’t realize that Liz Torres was also on AITF. Which I’m taking to mean that they’ve been actual friends for decades, which I like. I do hate when people ride bikes on TV and in the movies without helmets. I know it’s not as cute that way, but much safer. Next week: is the last week, friends.